inSPAration Spa and Bath Fragrance is a blend of aromatherapy fragrances specially formulated for the use in Spas, Hot Tubs and Whirlpool Baths. All of our Fabulous Fragrance Blends are safe for all jets, motors, pumps and tub surfaces. inSPAration will mask any unwanted chemical odor without effecting your hot water chemistry. Our special fragrance blends have body moisturizers that leave you feeling soft and moisturized, without oily residue on your skin or in your tub. Check out our product showcase for information on all of what inSPAration has to offer you! 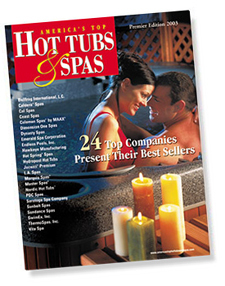 Check out our ads in these great backyard publications. Available at local book stores and magazine racks nationwide! If you are not a dealer and wish to purchase our product please click here for a list of Online Dealers offering inSPAration products. Please enter the following information if you would like more information and product updates.